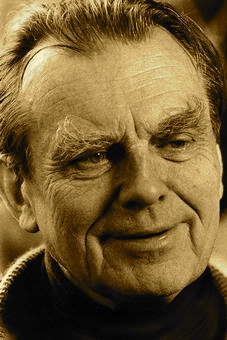 A Year of Being Here: Czeslaw Milosz: "Eyes"
My most honorable eyes. You are not in the best shape. And if a color, then it's dimmed. 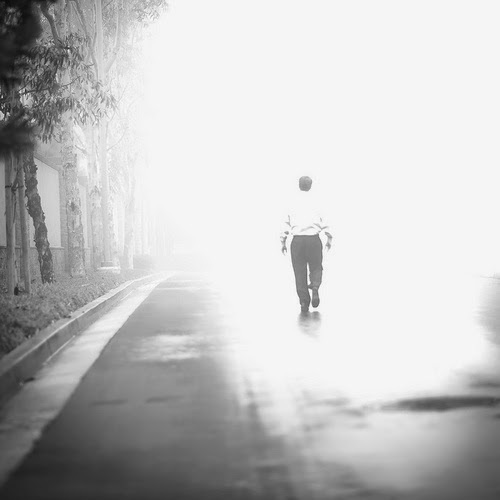 With whom I would set forth in the early morning. Lands and cities. Islands and oceans. Along trails just dry from cold night dew. For monkeyish dresses, shrieks and drum beats. "Eyes" by Czeslaw Milosz, from Second Space: New Poems (Ecco, 2004). Poem translated from the original Polish by Czeslaw Milosz, Carol Milosz and Renata Gorczyńsk, as presented on Visegrad Literature. Art credit: "Go into the Light," photograph taken on November 18, 2010, by Eric Nelson. Ah, I recognize myself in Milosz's poem. Never was I so astonished to find color as I was after I had cataracts removed! After the first one, I realized I had been looking at the world as if through a tobacco-filmed glass. What a surprise to find how vivid orange is, how hard and bright the winter sky, how very white my hair was, not yellowed with age, but a shining white that nearly glows. This poem also reminds me of "Monet Refuses the Operation" by Lisel Mueller. In it Monet has a sort of opposite take on the changing of vision, one that an artist might understand and appreciate. As for me, I am glad of advances that gave me back a colorful world!